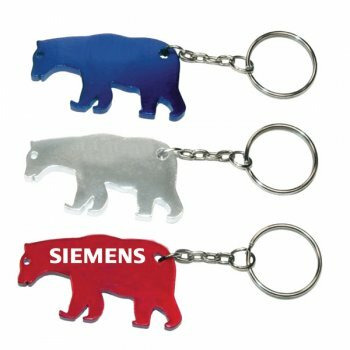 Custom bear shape bottle opener with animal keychain is becoming a very favored choice for value building for many small budget marketers because this token largely affordable to them. They can utilize the large imprint area for positioning their business messages such as logos, slogans, etc. It stands perfect for promoting wildlife care awareness campaigns, advertising veterinary hospital and many more. Marketers can avail exciting benefits by ordering it in bulk. This key holder bottle opener is a perfect way of enticing youth to your business. Request a quote to know price savings on wholesale custom bear shaped bottle opener keychain. Features – Bear shaped aluminum body in metallic finish. Available Colors - Metallic Black, Metallic Red, Metallic Blue and Metallic Silver. Imprint area - 1 1/2" x 5/32", 1" x 1/2". Product Size : 2 1/8" x 1 1/8"
Product & Design Quality -Exactly what I wanted, looked great! Customer Service & Shipping - Your staff does a great job keeping the customer up to date with the current status of their order. I appreciate the communication and follow up they provide. 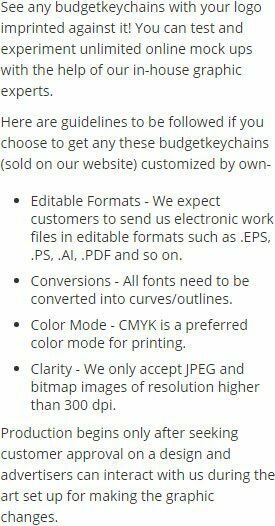 Product & Design Quality -I wasn't sure what I was able to fit on the bottle opener/keychain for a wedding favor and they helped me over the phone design emailed me final and I loved it.